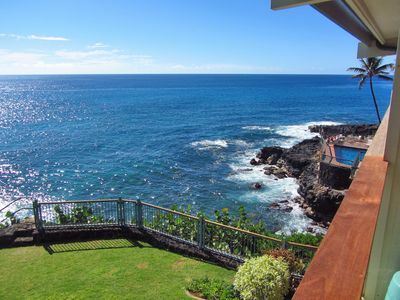 This beautiful view room overlooks all of the pools and the ocean. The room is almost ocean front. This room is on the top floor in building four with a king sized serenity bed and ottoman chair. 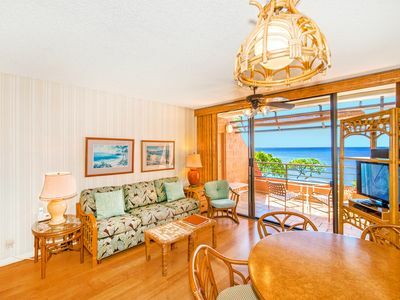 NOTE: If the dates on this calendar do not coincide with your desired booking dates, we have another premium view room that is also top floor in building two with an ocean and pool view VRBO Listing #325147 which has two double beds. If needed they can bring in a roll away bed for $20.95 + tax per night. 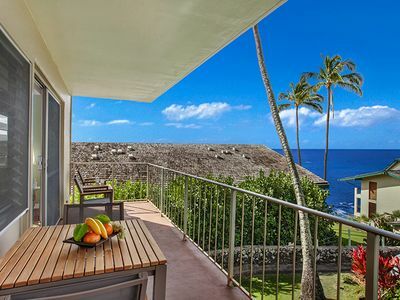 If you want to island hop we have a one bedroom condo in Kailua Kona on the Big Island with a view from the lanai of the pool and ocean. Please scroll down to see additional resort fees. 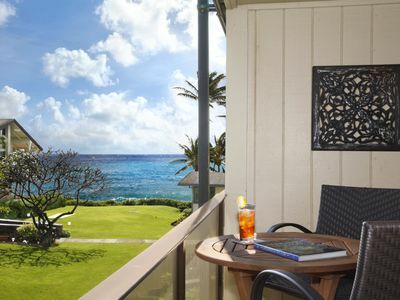 Find the perfect combination of ingredients at the Kauai Beach Resort . 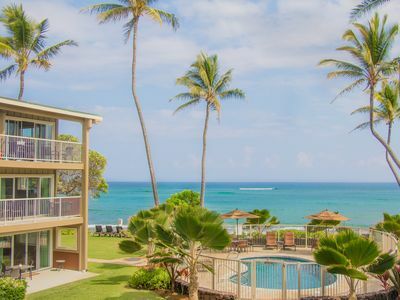 . . oceanfront location, fascinating pools, Polynesian entertainment, gourmet restaurant, poolside dining and bar, lounge with nightly live entertainment and a new fire pit outside, a convenience store with specialty coffee, room service, gym, rich décor, low rates. Who could ask for anything more? Perfect for kids. Romantic for adults. 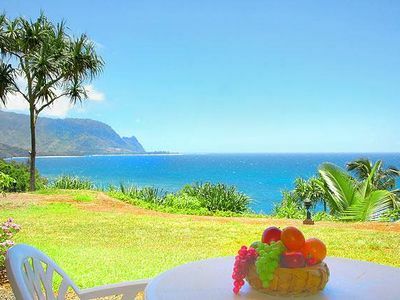 Kauai Beach Resort will fill your days and nights with adventure and luxury. 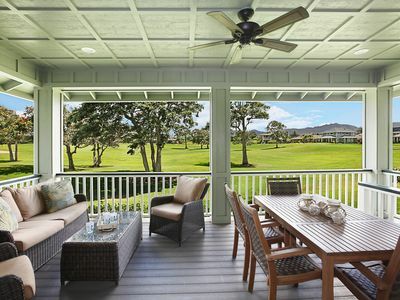 From the moment you enter the lobby, you are met with the warmth of a plantation home. 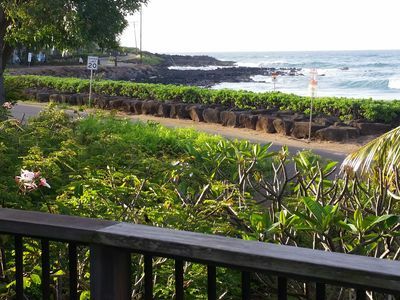 The entire resort went through a $16 million dollar renovation. 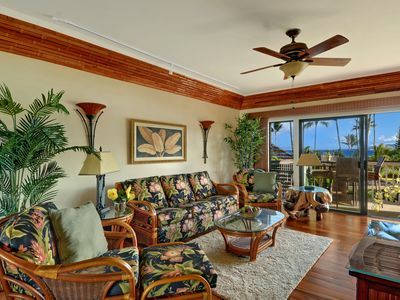 Modern tropical furnishings and contemporary design are accented by warm woods, Hawaiian art, and intimate seating. 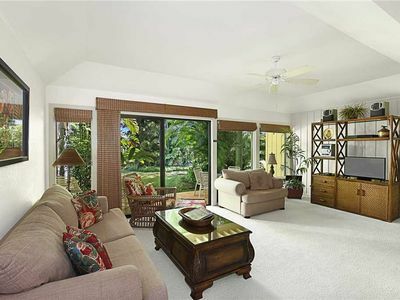 High ceilings and glass capture the natural light and balmy ocean breezes. Like old plantation homes, the hotel connects to the garden, spas and pools through a beautiful grotto and waterfall. Discover a tropical landscape of cascading waterfalls and exotic lagoons. 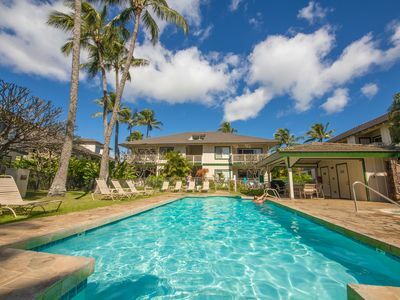 Enjoy a refreshing swim in one of four swimming pools, including 2 lagoon pools with waterfalls and a 75 ft lava tube water slide, children's pool, and a sand bottom pool. Relax in soothing hot tubs, get your work out at the fitness club and enjoy the sauna or pamper yourself with a rejuvenating body treatment at the Hawaiian Rain forest Spa offering massages, hot stone rituals, invigorating facials, and hand therapies. 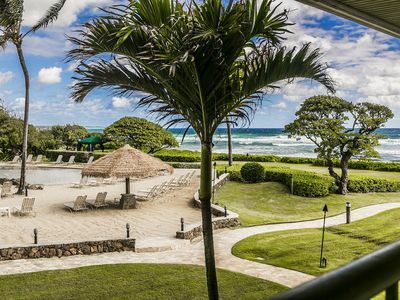 Set on 25 lush acres on Kauai's longest beach, this luxurious beach front resort surrounds you in the natural beauty of Kauai. It is near the airport, between the north and south shores. The resort has a business center and banquet/meeting rooms. 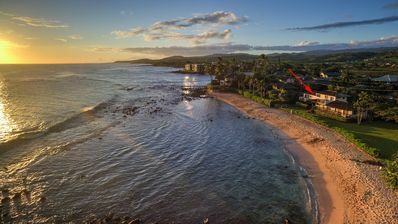 It is close to exotic hiking, boating, fishing, snorkeling, helicopter tours, kayaking, paddle boarding, luaus, waterfalls, historic walks, and several nearby golf courses. 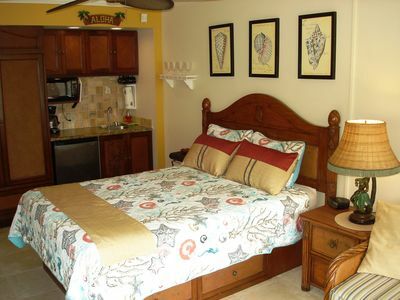 Relax in room 4208 with a king sized serenity bed, high speed internet access, WiFi, cable TV, travertine and marble bathroom ,and a private lanai with an ocean and pool view. There is a microwave and large comfy sofa in the lounge in building two on the fifth floor. 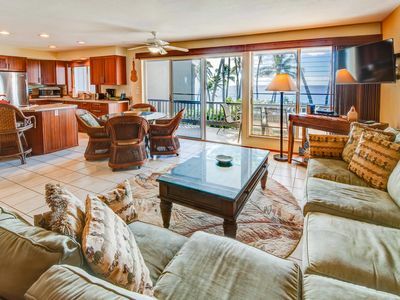 You can relax while you warm up dinner to enjoy back on your private lanai. This luxury accommodation is also a bargain. Enjoy free WiFi and free use of the sauna too! 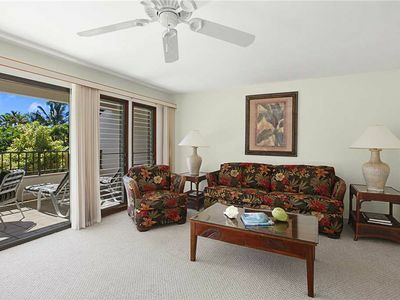 When looking to renting here, any odd number room is facing the parking lot or away from the pool/ocean view. There is a one time resort fee of $100. and a $100. check out cleaning fee. If you book seven days or more, it is suggested to have a mid-week cleaning, which is $75. They will do a full cleaning and restock your room. They stock the room with two rolls of toilet paper. If you are there for less than seven days and think you might need more, I recommend picking up a four pack at Walmart. These fees will be charged with your final payment. The resort has a $25. daily parking fee for self park or valet that you will pay upon checking out. If you want towels and trash changed, it is $15. per request. We have lowered our nightly rate to off set some of the fees. 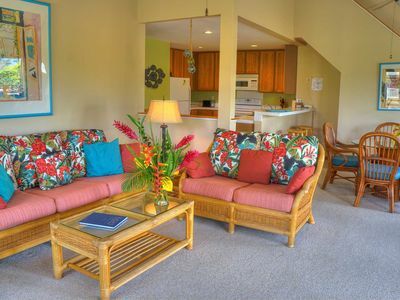 Guests of owners, like us, who aren’t in the rental pool, are excluded for any craft activities and free mai tai’s on Tuesday during the hula show. Please include your phone number on all reservations. 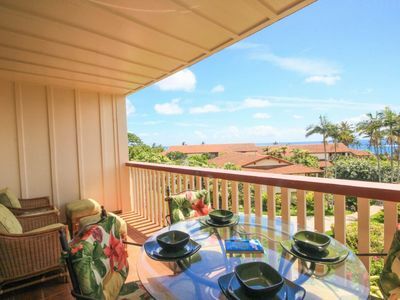 Makahuena #1202 - Great Poipu Value close to Poipu Beach Park! 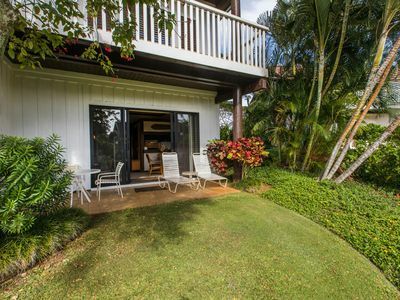 Hale Ohe - Location, location, location! 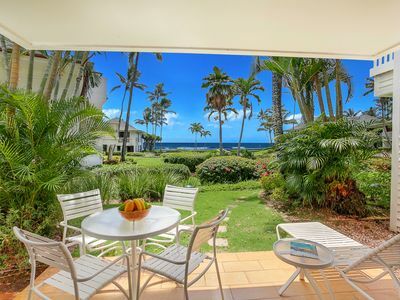 Just Steps Away from Baby Beach! 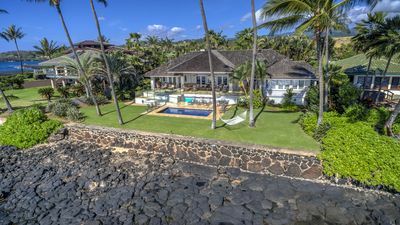 Amazing 5 Bedrooms for 14 in Poipu Kai!